What the devil DOES NOT want you to DO; do you know it? What The Devil DOES NOT Want You To DO! 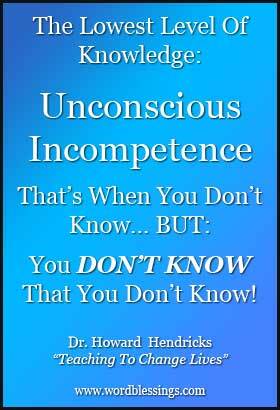 Do You Know It? When you find out what the devil DOES NOT want you to DO, will you be bold and do it? Do you know it’s possible for us to be focusing our intellect on a very practical and helpful biblical principle — and at the same time be struggling with a problem that we could benefit from by applying that principle? True! Allow me to illustrate with an example. John was relating his harrowing experience to me over a cup of coffee. He had gotten lost in a maze of city freeways in the dark of the previous winter evening. He seemed to be quite shaken as he related the incident. After a detailed telling of his story, John realized he had occupied the entire conversation, so he asked what I had been doing recently. I had just received a shipment of several more sets of Scripture cards and decided to show some of them to John. In order to explain how even committed Bible Christians can fail to recognize opportunities to apply Bible wisdom, I need to show you what I showed John. 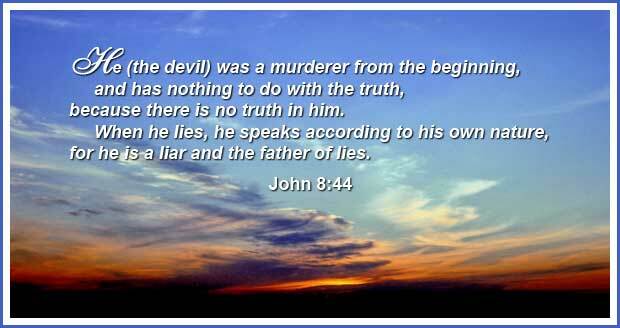 As you can see in the Scripture/photo below, I wanted to tell him about how Jesus teaches that the devil always lies. Just as God cannot lie, Satan and his demons cannot tell the truth. thus we also know that the opposite of whatever he says is the truth! As I talked, John nodded as though seeming to understand what I was saying, but at the same time he seemed very distracted. Lunchtime was approaching, so I invited John to my house, promising something to eat. As we walked toward the car, I could see that John was becoming more agitated. I asked what was going on. Then the rest of the story came out. When John had gotten lost the night before, he had stopped at a gas station for directions. Later, when he arrived at his destination for the night, he realized that his zipper case containing many personal items, including his name and address and such, was missing! “I’m just so worried about where that case is!” he said. He began to speculate: could he have left it at the gas station? He’d bought a map at the gas station, and someone there had marked on it where he was, and highlighted the route to where he was going. He recalled the gas station brand, so we looked it up online and called them. They remembered him, and said that he had not left a zipper case there. John admitted he might actually have left the case on a small table just inside the door of his apartment. Suddenly John swerved into full-blown “what-if” mode. What if he was wrong?!! What if some criminal had it? His check book was in the case. What if someone wrote a bunch of checks and drained his account? The “thief” had his address! What if they broke into his apartment and robbed him? Or beat him up? Or worse?? John was tying himself into knots of fear, right in front of my eyes! Joanne and I drove him home later in the day, and there was his zipper case — on the small table just inside the door. It wasn’t until the next day that I connected the dots. THE DEMONS WERE DOING THOSE VERY THINGS TO HIM! All of those “What-If…?” thoughts were being injected into John’s mind by the devil, exactly as I had described it to him earlier. And neither of us had recognized it! Then, as I began to think about my own recent days, I realized that there had been several times when I myself had failed to recognize opportunities to apply Bible wisdom, and had instead reacted according to conventional worldly ways. I have to be honest and admit: that realization was very humbling. But it also made me all the more determined to begin watching for, recognizing, and acting on situations where I can use biblical wisdom. Like most challenges we take on, doing this gets easier with practice. However, unlike most other challenges, the practice of responding to adversity with kindness strengthens your relationship with God. Right there, James goes to the heart of what it means to live as an authentic Christian. You may be able to recite hundreds of Bible verses, but it’s useless “head knowledge” if you don’t apply the wisdom of God’s Word into your life. Wisdom is the ability to take Bible knowledge and plug it into the affairs of everyday life. I have emphasized item 4 in the list above, because it is the main focus of this article. But indeed, all five of the schemes of the devil listed are part of a strategy to keep you from advancing the progress of the Bible in any way. Are you getting a sense of why the Christian life is truly a spiritual battle? BUT: now that you know about what the devil does not want you to do, you can begin to fight back against his schemes. You know already that what the devil does not want you to do is to read the Bible. You also know (or should know by now) that God commands you to read His Word. You certainly don’t want to serve the kingdom of hell, so you’ll naturally want to be spending even more time in the Bible. Joanne and I have a copy of “Matthew Henry’s Commentary on the Whole Bible”. You could buy a copy for just a few dollars. Is there some area in your life — a relationship perhaps — where quarrels happen, and then afterward you regret what you said or how you responded? If so, make a decision right now that, when the situation arises again, you’ll react by taking the higher road. Have a couple of Bible verses in mind that you can lean on when you need them. Starting a quarrel is like breaching a dam. For what credit is there if, when you sin and are harshly treated, you endure it with patience? Everything Is A Test. EVERYTHING! I don’t make it a practice of reciting Scripture out loud when someone is trying to have a heated argument with me. Doing that is like pouring gasoline on a fire. But I can tell you this: calling these verses to mind has helped me earn lots of God’s favor! At first, you mght fail to remember to apply Scripture during moments of adversity. I say that from my own experience. Forming a new habit takes time. And — I don’t know if this is a good thing or not — you’ll probably experience many opportunities to put this wisdom into practice. Also: if you fail in this at first, don’t let the devil try to put you down, or call you a loser, or tell you that this “Bible stuff” doesn’t work. When the devil tries to remind you of your past, just remind him of his future! Oh, by the way, here’s something the devil DOES want you to do. If you’re thinking of taking this Scripture memory stuff seriously, the devil would like you to start… tomorrow. That increases his chances of seeing to it that this particular “tomorrow” never comes! So, let me ask you again: now that you know what the devil DOES NOT want you to DO, will you be bold and do it? See what I mean? Two groups. There are those who really take God’s Words and His ways seriously. And there are those who do not. This is something everyone needs to know about. Watch for it. An easy way to find out when the next article is ready is to sign up on my mailing list. There’s a place to do that in the green box right below this article. There’ll be no pressure; I will never sell or give away your email address. And of course, you’ll be able to unsubscribe at any time.